Norways Telenor is a telecoms giant and is making steady progress beyond its home borders. The Company has a few telco-based challenges in places as far away as, for example, India. The company delivered its latest numbers on May 8th. It was recently reported the United States is considering the establishment of a space tracking facility at Exmouth, which is located in the northwest of Western Australia. Everything old is new again in the satellite market. For the bulk of the space agefrom the 1960s through the mid-1990ssatellite systems grew in size and complexity, built to handle increasingly challenging missions. As more powerful launch options became available, satellite size continued to increase in step. However, over the last decade, the industry is experiencing a resurgence of small satellite technology, with a focus on nanosatellites such as CubeSats. In some ways, this is a return to form for the industry: The first American satellite in orbit, Explorer 1, weighed in at just under 14 kilograms. This time, interest in small satellites is driven not by a lack of launch options but by improving technology that enables satellite developers to create low-cost platforms without sacrificing capabilities. Patrick Shay brings 25 years of experience in creating and developing new markets in the GPS and wireless marketplace. As vice president and general manager for data services at Iridium Communications Inc., Shay provided the strategic leadership necessary to grow the companys business in this markets area. Under his direction, the satellite data business became the fastest growing market segment at Iridium, experiencing 60 percent year-over-year growth and serving customers in industries such as transportation, people tracking, maritime, aviation, oil/gas and government. Executive Spotlight: Peter Mabson, President, exactEarth Ltd. The exactEarth team is led by Peter Mabson, who brings over 27 years of experience in the space sector and product businesses. In particular, Mr. Mabson has held various executive positions within COM DEV related to the creation and development of new businesses and new business opportunities. In the last decade, the satellite payTV industry has become global and has reached a critical size in the digital TV market. Close to 140 satellite payTV platforms are currently in operation around the world, covering more than 100 countries in the different regions of the world. The number of platforms has more than doubled since 2001. In the last couple of years, close to 30 new platforms were rolled out. Most of them operate in emerging digital markets. In the recent past, Latin America and South-East Asia have clearly been two of the most dynamic regions. An increasing number of countries have at least one active platform, the latest countries to roll out services being Myanmar (Burma) and Georgia (Europe) in 2011. The 2012 London Olympics are nearly upon us and broadcasters from across the globe are getting ready to descend on London to capture that all important coverage live from the action. With the Olympics playing host to 216 nations, taking part in a total of 300 events, that will be no mean feat! Alan Mercer, Operations Director, SatStream, explores the critical elements of ensuring a successful Olympics broadcast. As the cost of consumer satellite systems and bandwidth drops lower and lower Internet access becomes more wide spread and the demand for secure connections from remote worker locations to Company headquarters, or branches, is increasing. Intelsats latest announcement of a new High Throughput Satellite (HTS) platform (EPIC) for, among others, mobility services is a sure sign that the focus on higher capacity has taken hold of the mobile satellite market. What does this mean for the industry and customers, and how will other operators, such as Inmarsat, react? 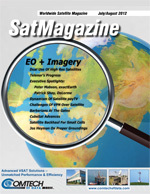 Prime: ImageryDual Use Of Very High Resolution Satellites, By Rani Hellerman, Vice President, Business Development, ImageSat International Ltd. There is no doubt that the commercial very-high-resolution satellite data business has reached a critical level of maturity. The industry has applied itself to the growing challenges of the civilian and national security applications. ImageSat International is playing a key role in this trend. STEM Flix is a new, interactive video series provided by the Northrop Grumman Foundation and Science Bob thats all about having fun with STEMthat is, SCIENCE TECHNOLOGY ENGINEERING and MATHEMATICS. Growing up in a ranch family, I heard plenty of cowboy wisdom about closing the gates after the horses have all run off. So, I naturally tend to think about U.S. protection of space technologies in similar terms. The previous two articles on the Isle of Man space industryLocation, Location, Location and Development, Development, Development have explained why the Isle of Man has become a centre of excellence for the operation of orbital filing companies and space related industries and how the Islands space industry has developed significantly from its small beginnings in 2001. Mobile operators around the world are witnessing a surge in data traffic as smartphone use increases, devices become more affordable and network capacity expands. One way in which they are responding to this data explosion is by adopting new, small-cell architectures that can better target underserved areas in developed markets, and extend services into previously unconnected remote and rural areas.